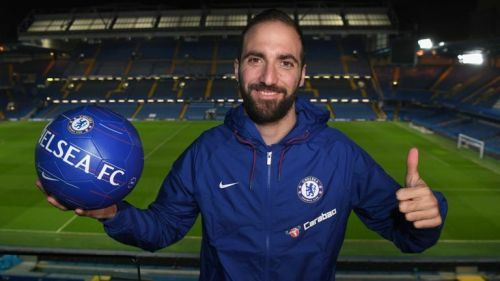 Chelsea's new signing, Gonzalo Higuain reveals that he is delighted to be reunited with his former teammate, Jorginho at the Stamford Bridge. Chelsea signed the Juventus striker, Gonzalo Higuain on loan for the remainder of the season with an option to buy him for £31.3 million. The 31-year-old earlier played under Sarri at Napoli for one season. He scored 36 league goals during his solitary season under Sarri, which is an all-time record for most goals scored in a single Serie A season. Jorginho was also a part of that team and both of them enjoy a great relationship. Higuain was picked up by the Italian for his first training season with the Blues. Speaking to Chelsea TV, Higuain said that he is delighted to be reunited with Jorginho. “It was my best year as a player and he’s a wonderful midfielder who contributed to that,” Higuain told Chelsea’s TV. Chelsea will play Tottenham for the reverse leg of the Football League Cup semi-finals later today and will be looking forward to overturning the tie after losing the first leg 1-0. However, Higuain was not registered on time to play the game and the Argentine have to wait until Chelsea's FA Cup fourth round game against Bournemouth for his debut.